London is a great city for unusual musical events, many of them free and at the Colleges. 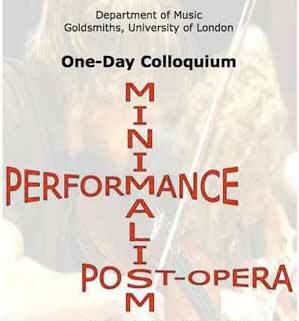 Goldsmiths in Deptford recently had a Festival Russian Music, PureGold, which Musical Pointers sampled. Last weekend Keith Potter and Pwyll ap Sion hosted a learned Colloquium on Minimalism in which one swiftly learned that music which some of us are inclined to reject as too simple is decidedly not so. Its study engages brilliant international researchers who came together to share up to date thinking - one Continental expert was balked by the Eurostar fire under th Channel - and there is indeed a Society for Minimal Music. I found the papers in the morning session engrossing to listen to despite but intermittent understanding. Tara Wilson of Goldsmiths discussed a new critical approach towards "Analysing the 'Esthesic' within (post-) Minimalist Music, with a comparative case study of how non-musicians responded to 'post-operatic' works of Alexander Knaifel and Philip Glass - one of her subjects found a passage of a Glass opera induced "fatigue", would you believe... Virginia Anderson of Nottingham surprised composer Dave Smith by her take on his I Fought a Monster Today a political melodrama (piano and spoken voice) with text by Bobby Sand anticipating his death during the height of the Troubles in Ireland, assessing it in terms of "post opera" experimentalism. Equally challenging was Jelena Novak on "Repeating the Body in Music: the corporeal identity between performance art and post-operatic spectacle"; we certainly came away with a broadened outlook on what is Opera now. John Pymm of Wolverhampton analysed the verbal complexities of Reich's "Different Trains" which he saw as the nearest that mainly instrumental composer had gone towards "Opera" as it is continuing to develop in all manner of modes in the changing 21st C cultural world. Goldsmiths featured too in one of the presentations at the quarterly meeting of one of the most lively of specialist societies. The Lute Society met in the City, at the Dutch Church near The Bank; anyone interested can join the members free. During the afternoon they tackled the knotty problem of "Typesetting lute music on your computer". Anna Langley deftly demonstrated the free system of Abc Tab, which seemed better suited to members than some more expensive alternatives which had been developed more with guitar in mind. Tim Crawford of Goldsmiths, in a session about future developments, gave a lucid exposition of his Department's project to computerise thousands of editions and manuscripts of lute music, to provide an archive for future use; many of those had clear errors which presented problems. They were were purposely left uncorrected for future scholars. Paula Chateauneuf, eminent specialist player of "low lutes", talked about a hitherto unknown manuscript of Roman origin c 1620 which she had seen all too briefly at Sotheby's - a rare example of a musician's working notebook with extraordinary practical information on ornamentation, ideas which she afterwards incorporated into an improvisation as part of the Society's recital with Mark Tucker, tenor. He was well remembered from his singing - and a notable talk A lost art - Monteverdi, music and classical rhetoric - in a Monteverdi study weekend at South Bank 2003. Their Fiori musicali romani sequence of Caccini, Peri, Frescobaldi, Domenico Mazzocchi, Luigi Rossi, and Kapsberger was sheer delight, that greatly enhanced by the ambience and acoustic of the hall underneath the church, and attended by a large appreciative audience. The programme was so well organised that there were clamours for it to be recorded; astonishingly, although the two artists had performed together for more than two decades, they had never yet recorded in duo! After that feast, a walk northwards (in a rare sunny afternoon during a wet September) to Shoreditch Church, for a "low flutes" gala event by Carla Rees on alto and bass flutes, in mainly new compositions by little known composers. Her enterprising recital attracted a good turnout of around 100, but I was disappointed by the indifferent quality of the music heard, and it proved something of an anticlimax to a memorable day's Music in London.